I got a surprise birthday present: a new laptop. Per my naming convention, it’s LSW8. There’s still a lot to get used to. Windows 8 is odd, and I’ve already had it with the touch pad. Thankfully, I had a mouse I could plug in (but it has a wonky left button, and apparently, the touch pad isn’t disabling without a fight. I also need a proper media player. Apparently, both Windows Media Player and Winamp are dead. I guess I could install iTunes? I don’t know. I haven’t even had this thing 12 hours. I mean, I used to have a lot of programs on my desktop, and I did I lot of things that didn’t require a browser that I either had to do in the Chrome browser or not at all. The best thing is that I have Word again so I can get back into finalizing Brown River Blues. Being away from that text for the nearly two years has been rough. But at least it gave me time to ruminate on some points and look at it with a fresh eye. Here’s hoping EIGHT lasts longer than the previous seven. The battery is amazing so far, so that’s a start. A decade ago, I dressed in a tux and developed a taste aversion for tequila (and, thankfully, not birthday cake). Today, I’m up at 4:30 a.m. because I left work after midnight and decided I wanted to make fettuccine Alfredo. I’m 32. I’m frickin’ 32. I worked today because I used my floating holiday for my anniversary. We didn’t have anything spectacular planned because we both have grownup responsibilities this week. We’re saving the fun for our trip later this summer, a trip that isn’t our official honeymoon. I like how we have this informal agreement that all our trips thus far don’t count. Our trip to Hawaii at some point next year probably will be our official honeymoon, despite plans to see Bill and Karen and, hopefully, two of Theresa’s children. I really hope I can see Shonda and Michael, but there are some logistics to work out, especially since they have jobs now. They’re growing up so fast. As I said earlier, I worked today. Never mind that it’s almost dawn. It seems weird to call June 23 “yesterday” because I haven’t gone to bed yet. I’ve effectively stopped celebrating on the day unless it’s a weekend. I’m instead breaking it up into seeing an interesting concert at the Garage on Wednesday, fancy dinner on the Downtown Mall on Friday and then some drinks. I originally had a point to this but I’m starting to fade. I have lost my train of thought. Holy crap, I’m married and 32. Five years ago, I was in the Chimborazo house, fresh from a road trip with Bill and Karen and Bill and Karen hadn’t realized they were in love yet. September marks three years of working in Charlottesville. October marks three years of living in this house. It seems a lot closer than that. Time really starts to go by fast. This is my first photo with Bill. This photo from my wedding ranks second only to the photos with me and my wife. From the fog machine era at our fraternity house. There is a long story with this photo that I shan’t tell. Happy birthday, Bill. I can’t wait to be in your wedding next month. TDF. Our story starts in Richmond on Friday, because of course my wedding had to involve Richmond in some form or fashion. I headed back to my old stomping grounds in Church Hill to have my favorite, formerly friendly neighborhood, barber cut my hair. He went out of his way to make it into the glorious beard you can see in the photo I posted yesterday. It was the most intense barber visit I’ve ever had. Ben having to work his way through more than four months of unbridled hair growth probably aided in that. Afterward, my destination was Craig’s house. My mom’s bus arrived in Richmond on Saturday and I figured the easiest way to do everything was to just be in Richmond already. Also, I had no idea exactly how any sort of bachelor party would happen so I thought being in Richmond one day and Charlottesville the other would be the best course of action. It would have helped if I remembered to charge my phone. While my phone was dead, Craig and I went to Friday Cheers downtown to see St. Paul and The Broken Bones. I needed a good concert in my system. Of course I have their album now. We got drinks afterward with some friends. I would have grabbed more people but my phone was beyond doornail at this point. After that, I got a pretty good night’s sleep. I’m glad I did because I needed it Saturday. Where do I start with Saturday? Would it be me slightly fretting over not getting a refund back yet from the University of Virginia? Would it be me being in Richmond way, way longer than I expected? Would it be getting to the reception hall late and the Fry’s Spring Beach Club’s coordinator freaking out because there was miscommunication? Would it be that we never got a chance to map out moving the wedding entirely there? Would it be at 6 a.m. Sunday, when I thought everything was fine until the food arrived entirely too early? I think some people will talk about how stressed out I was for quite a while. But it all worked out. At UVa, the trees in the garden contracted fire blight, a disease that makes them look like they’ve been burned. The best plan of action to save the entire tree is to aggressively cut the portions that were stricken. It’s currently a lovely promenade of half-dead sticks. Additionally, the forecast varied wildly from high 90s and incredibly humid, like some days in the middle of last week; mid-80s and stormy, like some of the later days last week; and a what seemed like an impossibility: times of clouds and sun with a high of 78. That was exactly what we got. Despite the torrential rains, dead trees, panic and literal last-minute changes, our wedding was outdoors with living trees on the second most pleasant day so far this June. The first was 75 and partly cloudy on June 1, this blog’s anniversary. Much of the day is a blur, obviously. But it was such a great day in Fry’s Spring. Some people I have known for years mentioned that until Sunday, they hadn’t seen me smile that much. Or ever. Of course I was: I told myself 12 years ago I was going to marry that woman and here we are! It was the happiest day of my life thus far. And I had a pincord suit with a matching hat. And white shoes. The next day, yesterday, was my birthday and it was more of us starting to catch our breaths. We’re continuing that today. I can’t remember the last time I hadn’t done more than go out on the deck by 2:40 p.m.
Well, I bet you’re looking for photos. As I said in the title, there will be photos. A ton of them are on Facebook and I’m giving people a day or so to send me their favorites to the wedding email before I go through them all and post some. Also, I should have some from Ryan next week or so. Other than that, I need to get that typewriter fixed so I can start sending out thank you letters. And get ready for work Thursday. I took the Blue Ridge Parkway to Roanoke. I celebrated my birthday Sunday doing what I do best: Driving. I also got a new phone, which posted this entry before I was finished. OK. That was totally my fault. But whatever. There was no reason to go to Roanoke besides why not. Renée and I took the Blue Ridge Parkway there because it’s been a while since I’ve driven for pure pleasure and enjoyment, and I like driving in the mountains. 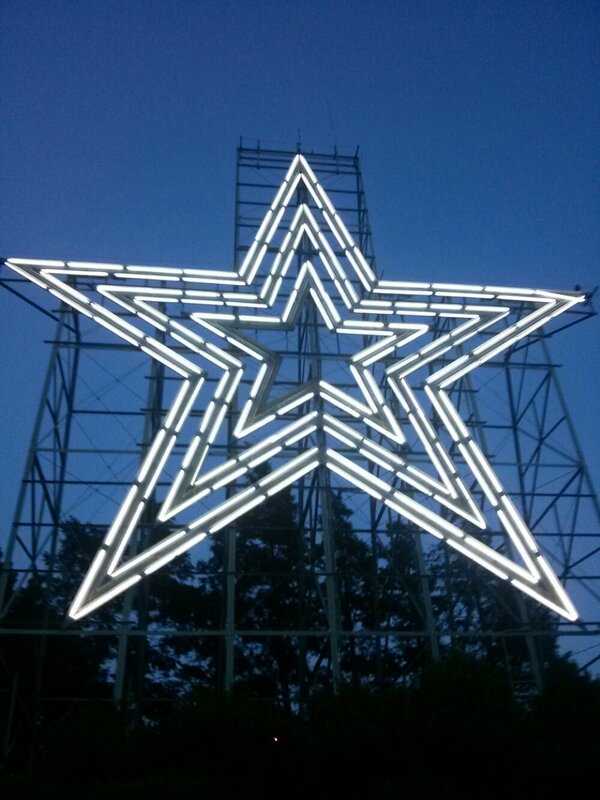 After we explored downtown and had dinner, we headed to Mill Mountain within the city of Roanoke. 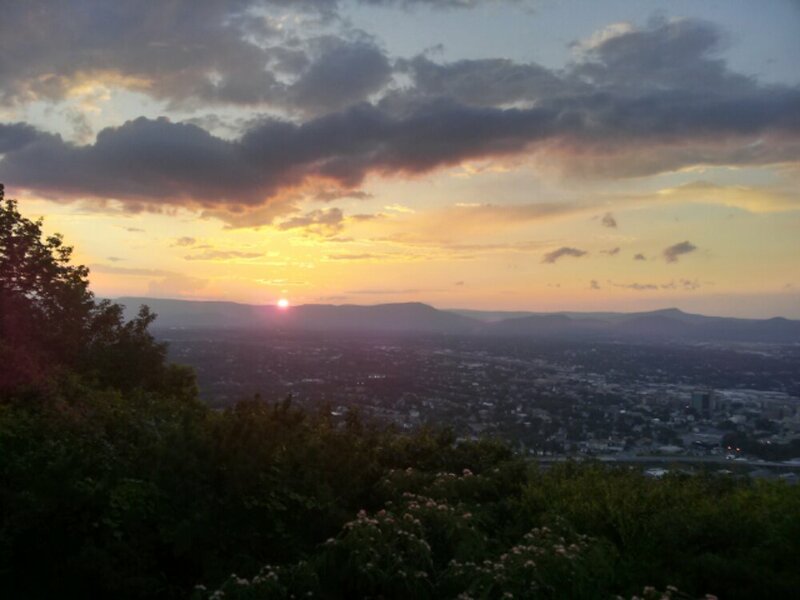 Sunset over Roanoke. I could have done a better job of shooting this. We met up with Rachel, one of my friends through my tangled web of knowing Pat Kane and everyone else in North America. This is continuing my trend of picking a random place to visit in Virginia and then remembering that I know someone there. That happened in Lynchburg a few weeks ago with Bogle. 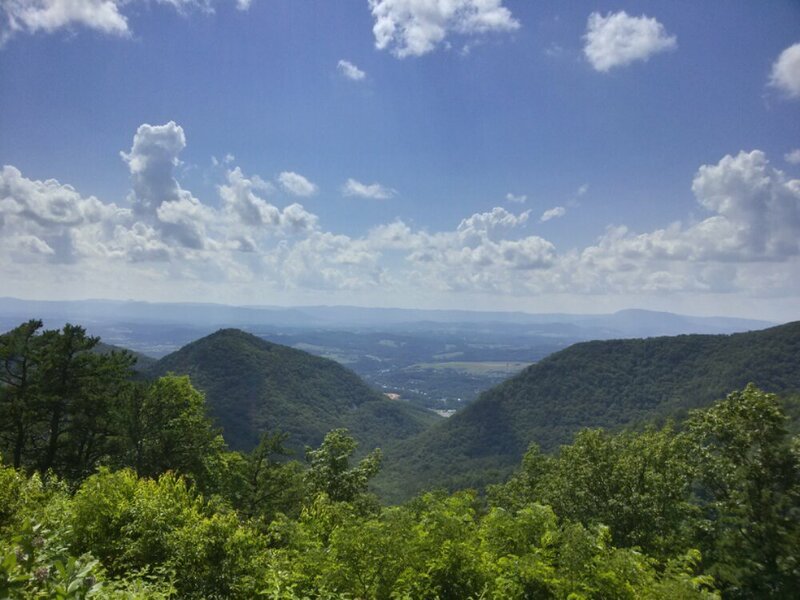 I wish Charlottesville had an overlook. Because I rarely take photos of people on purpose, my phone was a-dyin’ because it wasn’t fully charged when I got and I was screwing around with it the entire day, these are basically the only photos. The three of us looked over the city and the supermoon for a while before getting ice cream and talking in front of a strip mall until after 11 p.m. I then took the surprisingly short trek up Interstate 81 back to Charlottesville. Although this doesn’t match many of my post-20 birthdays, I enjoyed myself. We’ve covered a lot of ground in Virginia in the past few months, which is what I love to do. I haven’t been to Roanoke since 2004 when Simone a-sploded near Whitetop Mountain. It was the first time I really stopped and looked around. I could totally live there under its neon star if it came down to it. Obviously, I’d rather be in Richmond or some other major city, though. Mostly Richmond. My 30th celebration continued its low-key start with a trip to the movies today and more ice cream. Then I had a wild night of drinking an entire half-gallon of cranberry-grapefruit juice and eating pomegranate Greek yogurt. Wild times, I tell you. The debauchery continues on my third day of vacation with me mowing the lawn, finishing laundry and buying duct tape. Don’t worry: I’m not going soft. There will be celebrations. Oh yes. My mom wants to go to a karaoke bar Wednesday night. I haven’t gotten belted out a song in public since 2011. I miss it. I should have enough free time to hunt down a few people on the Peninsula. I still might work in visiting people in NOVA or something and there’s my unofficial birthday party in Richmond on Saturday I’ll be three, technically seven hours late to. There’s absolutely nothing I can do about that. And, anyway, next year is going to be the party. Oh yes. I have two more days of my 20s left; I’m not fully comprehending this. I mean, I knew going into this 10 years ago that this would only be for 10 years. I guess it’s that, a decade ago, being 30 meant being a real adult, being boring, being balding. I think the funny thing about it is that a lot of my friends are none of those things. A handful of us are married and a handful of us have kids. If anything, it’s like some of us are twenty-nine going on twenty-ten. I guess being too young to be in Gen X and too old to be a Millennial has turned the early 30s into the 20s in extra innings. My beard is getting more salt-and-peppery with each passing day. Seriously. I took my Facebook profile picture on the first and I can see how much more of it there is. Meanwhile, above my ears, a month has gone by since my last haircut. Even five years ago, that would have meant my hair would have been ridiculous. Instead, it’s making me notice that I’m nearing the point where my forehead is going to file an annexation suit. I’m intimate friends with some people who haven’t seen my the top of my head in person so that doesn’t really matter. It is a little hilarious that not wearing hats and wearing contacts more or less was experimentation in college. I applied for five days off from work for my birthday and magically got 10. And I still have six vacation days left. I didn’t know that far in advance so I didn’t plan that much. I want to visit some friends outside of Virginia and that’s just going to have to wait for a three-day weekend in the fall. Frankly, I’m more excited about seeing them than the upcoming week. It’s mostly because I haven’t had a personally-driven-out-of-state road trip since moving back to Virginia about a year ago. As for these 10 days, I plan on going home for a couple of days in the early next week, maybe going to NOVA during the week and definitely spending the following weekend in RVA. Even if I don’t go to NOVA, I have to go back to Charlottesville at some point during the week. Typically, I would make a round trip but I can’t get around backtracking regardless of what I do. I’m sorry, Mother Earth. Also, I plan on sleeping a lot during this vacation. Because I’m old. I should save the whole reflection on my life thing until I actually, you know, turn 30 but I’ve had writer’s block for quite some time and I’m inspired to write at the moment. I’m enjoying this whilst I can. So, 30. The big three-oh. What did I expect at 30? I assumed I would be married by now. I’m engaged. Close enough. I expected my novel to be done. Theoretically it is. I need to overhaul a small section but the writer’s block seized my fingers after I did the outline and I’m not in my optimal situation to write. So close enough, I guess. I thought I’d have a house by now. My mom has begun the process of transferring her house to me. I don’t know what to do with it when that happens in less than a decade because I’m roughly 140 miles from it and have neither current nor future plans to live in Hampton Roads again. I expected to have some sort of awesome job. After spending 2006-mid 2012 paying my dues, to put it extremely nicely, there are points where I am literally running a daily newspaper. I’m in journalism and there’s no other career I’d rather have. At least I hit a target. Of those goals I can think off at 3:30 in the morning, I’m probably going to hit them all in a couple of three years. I guess 30 really is 20-10. I guess, at some point, I’ll finish growing up. I’ve grown For now, I guess I should spend the rest of this year celebrating my 10th anniversary of turning 20. Onward six or so more years of greying, balding far from boring 20s. As I said last year, look out, 30: I’m coming for you. With a spectacular vengeance. Oh, and I got this totally frat-tastic birthday gift from Renée. It’s great to be a TauDelt celebrating his birthday. I’m keeping this on my desk at work. No you can’t borrow my freaking wood pen. Especially after I put an A.T. Cross Co. fine point black ink cartridge in it.